This online resource is a video that shows how a battery works. The Chemical Management Handbook was developed by Science ASSIST in recognition of a need for guidance on the safe handling, storage and waste disposal of chemicals in schools. Safety issues are a significant consideration in the teaching of microbiology as the subject is practical-based and there is potential for exposure to infectious organisms. This downloadable resource is an information sheet which describes the limitations of recirculating fume cabinets in the school science context. 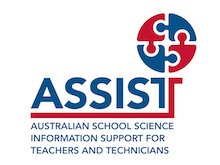 Science ASSIST is an innovative national online advisory service for school science educators and technicians. The project was supported by the Australian Government Department of Education and Training through the Mathematics and Science Participation Program from 2014 to 2018. Science ASSIST has an expert national advisory team with extensive, collective experience across all school laboratory management and safety. It is this team that will help with your enquiry.